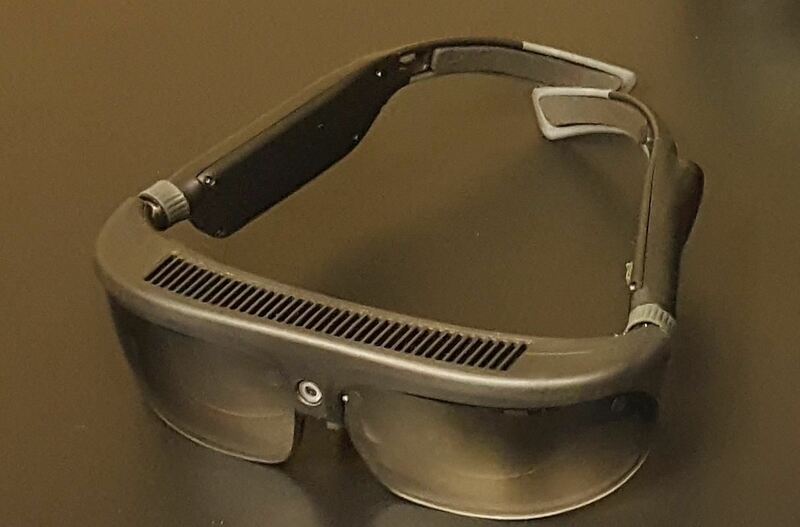 I had the opportunity to speak with the COO of Osterhout Design Group, Pete Jameson, shortly before the announcement of the company's R-8 and R-9 smartglasses models at CES in January. 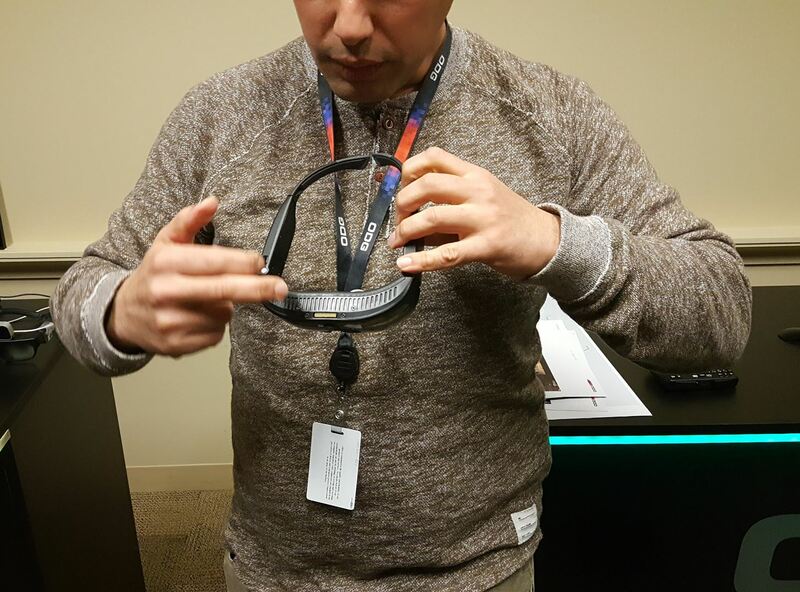 And while I sadly could not make it to CES to test the smart specs out right away, ODG invited me to do just that while I was in San Francisco for the Game Developers Conference. ODG has had a good deal of success in recent months with a Series A funding round reaching $58 million. This success showed. Both the R-8 and R-9 share a number of features: A Qualcomm Snapdragon 835 processor, Bluetooth 5.0, Wi-Fi (802.11ac), GPS, dual microphones, 6 DoF tracking, integrated directional speakers, and a USB Type-C port. The newer model, the R-9, comes with more storage and memory, a more impressive camera, larger field of view, better displays, and an expansion port, as you can see below. The units that were available to try out at GDC had demos fully loaded and ready. One was a space scene with the Sun, the Earth, and a floating satellite. A second demo was a 3D still-frame of a sci-fi war scene that allowed the user to walk around a bit and see the scene from different perspectives. Being a HoloLens and Windows Mixed Reality developer, and the overall HoloLens fan that I am known to be, many have emailed or asked about my thoughts on the upcoming products by ODG. Let me start with this disclaimer—it is hard to compare these devices to the HoloLens. While there are in a similar class of device, they offer distinct types of features that make them function differently. Below, I will make a few comparisons in areas that fit, but these should really be treated on their own. These units definitely look and feel much closer to real glasses than anything I have seen in the arena currently. They weigh far less than the HoloLens, and at a distance past 10 feet, could easily pass as a real pair of sunglasses. 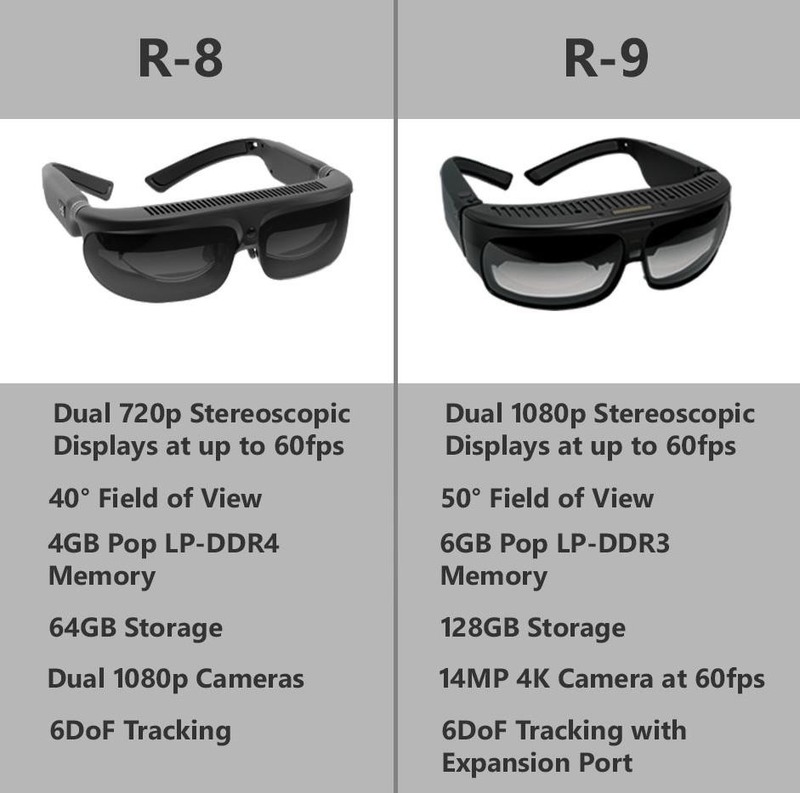 Unlike the HoloLens, the form factor of both the R-8 and R-9 are too small to wear with a pair of glasses. So one important feature that I had missed previously is their ability to have prescription lenses placed in them—with a simple snap. The ODG team had a selection of lenses at GDC for just that purpose waiting on the table for the glasses wearers in the room, thankfully. While many complain about field of view limitations on the HoloLens, I believe it's fine. I do see a place for a non-occluded mixed reality device with a completely immersive field of view in the coming future, but we need to get many other problems solved first. With that out of the way, the field of view for the R-8 is noticeably wider that the HoloLens—the R-9 is wider still. However, the field of view did not feel as tall as the other devices I have used. The demos that I saw were fully immersive applications, more in line with a VR experience, through a non-occluded headset. 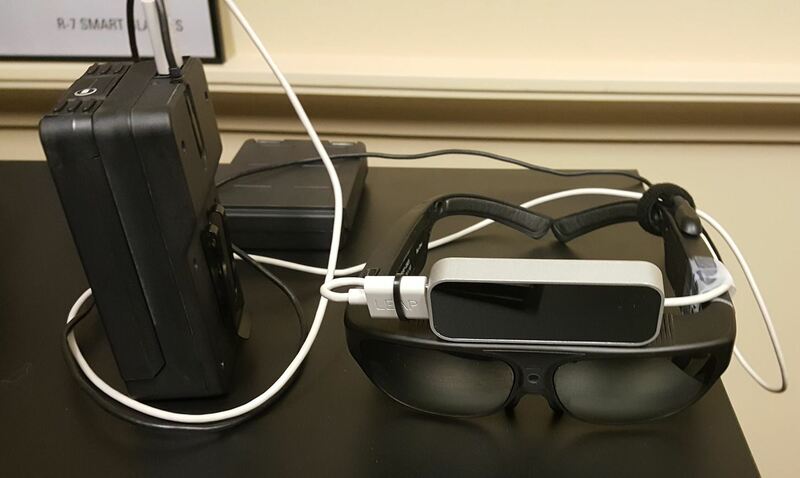 This is arguably not an ideal test for smartglasses. The projection quality itself was good, though it was a little darker than expected. Also, it seemed a bit more transparent that I would have liked. In all fairness, both the transparency and image brightness are factors that could, and most likely are, attributed to being under florescent lighting. My personal frame of reference, and in essence my base of expectations, is my development environment which uses far less harsh lighting. The inside-out 6 DoF tracking for the R-8 and R-9 was great. It felt fluid and accurate. Not once in the time I used either model did they lose tracking. The space demo was a simple scene that ran smoothly until you looked at the Sun. The shader that was being used on the Sun was a pretty high-quality shader. It appeared to be too much for the processor to draw in its entirety, running at what was likely 7–10 frames per second when staring directly at the Sun (of course, you should never do that in real life). The other demo, the sci-fi battle scene, was an intensely detailed scene and the unit did not seem to stutter a frame. My takeaway from that is while overall the performance was good, maybe the processor does not handle certain shaders very well. In both cases, the devices had some noticeable heat, which leads to my next point in the performance category. These devices get very hot. While not hot enough to leave a mark (probably), they were very noticeably hot after just a few minutes of use. Using fully 3D rendered applications outdoors in hotter climates, I can imagine a potential for overheating. Another question I have been asked about often when the subject of ODG comes up is whether it can be controlled with gestures or not. Of course, a device maker is going to openly talk about what their device can do, not what it can't do, but the simple answer is no—not out of the box. They have implemented the expansion port on the R-9 unit for just such a use-case, though. So this option will eventually be there once demand hits critical mass. They even had an R-7 model on hand with a Leap Motion sensor attached. Aside from a couple of Bluetooth options and the ability to use your phone as a controller for both units, the only onboard controls were a small selection of buttons on the right side. I personally would find this at least a bit awkward, as one of the many left-handed people in the world. Maybe they will have a version with left-handed controls as demand increases for these products. These devices may be missing a few features in comparison to the $3,000–$5,000 HoloLens. Coming in at a price point of "under $1,000" for the consumer-aimed R-8, and $1,850 for the higher-end R-9, they seemed to be priced competitively. Simply put, I like these smartglasses, and will likely own a pair as soon as they are available. The construction was very sturdy on the preproduction models that I demoed. They did not feel like they would break easily. The weight was great, and I could see myself wearing these for hours at a time without an issue. Heat issues aside, they felt great to wear. Aside from very specific frame-rate issues, and what I suspect was an effect of heavy overhead lighting, the image quality was good. I could see myself developing software for this device. And while I realize that ODG is trying to build its own Android-based platform, one point that would go a long way toward that end, for me, would be making sure it supports Windows Mixed Reality once the Qualcomm Snapdragon 835 is running Windows 10. Oh, and maybe ODG should get together with Occipital, whose office is across the street. I don't know, the Structure sensor, that expansion port—there might just be something there.